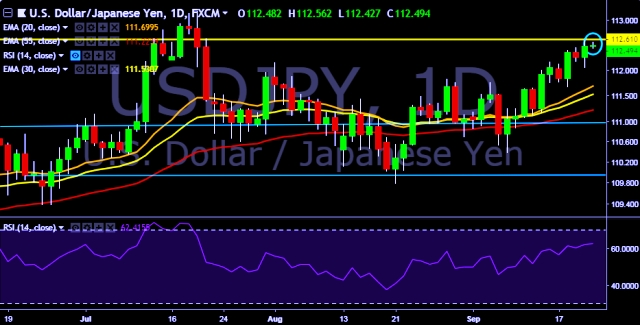 USD/JPY is currently trading around 112.50 marks. It made intraday high at 112.56 and low at 112.42 levels. A daily close above 112.48 will take the parity higher towards key resistances around 112.58, 113.20, 114.73 and 115.90 levels respectively. On the other side, a sustained close below 112.48 will drag the parity down towards key supports around 111.75, 110.38, 109.96, 109.36 and 108.34 levels respectively. Tokyo's Nikkei share average opens up 0.73 pct at 23,848.63. Japan Sep 2018 Nikkei manufacturing PMI flash increase to 52.9 vs previous 52.5. Japan Aug 2018 nationwide core CPI mm increase to 0.4 % vs previous -0.1 %. Japan Aug 2018 CPI, overall nationwide increase to 1.3 % vs previous 0.9 %.